Russian President Vladimir Putin will answer a large number of questions from citizens, public figures and media representatives. The Q&A session has been held annually since 2001 and will be broadcasted live. According to the event’s organizers, This year, some 1.5 million calls and messages with questions have been received for the "Direct Line". Russian citizens reportedly concerned about the condition of the country's infrastructure, the gas and oil prices, pension reform and the actual stance of the country's economy, and what the nation should expect after 2024, when Putin's presidential term expires. People are also interested about the latest developments in the government. Citizens also wondered if the authorities have any plans on raising the retirement age. According to the Rossiya 24 channel, which will broadcast the Q&A session, this year all of the questions an inquiries will be sorted by particular topics. Examples of categories include sports, tourism, business, sanctions, agriculture, 2018 FIFA World Cup Finals, economy, ecology and Russia's regions. The previous "Direct Line" session was held last year on June 15 and lasted for almost four hours. The event was broadcasted by all major Russian media outlets and news agencies. The Russian leader received some 2 million questions. Last year, Russian citizens were mostly interested in the spheres of economy, demography, international relations, housing, medicine and ecology. The president also touched upon the Moscow-Washington ties and the military operation of the Russian Air Forces in Syria. First "Direct Line with Vladimir Putin"
The first "Direct Line with Vladimir Putin" was broadcasted live by Russian television networks ORT and RTR and the radio station Mayak on December 24, 2001. At that time, Putin received 400,000 questions. Considering that the broadcast lasted for about two and a half hours, one hour longer than had been planned, Putin answered 46 questions. The studio from which the Q&A session was broadcast was connected with sites in Moscow, St. Petersburg, Kaliningrad, Murmansk, Kazan, Rostov-on-Don, Yekaterinburg, Novosibirsk, Vladivostok, and a settlement in the Krasnodar Territory. The president then promised to continue to hold these sessions to answer citizens' questions through live broadcasts. The second session was held on December 19, 2002, and was also broadcasted live by the major television networks. Those session lasted for 2 hours and 35 minutes. Vladimir Putin answered 51 questions, while the call processing center received 1,422,000 calls. Unlike the first session held in 2001, when the studio was mainly connected to large cities, in 2002 the studio spoke to six regional centers, two villages, and two towns. The bulk of the questions reffered to social issues, such as income, pensions and high utility rates. About 20 percent of the questions concerned living standards, about half of which were about housing. Like in 2001, the majority of questions came from pensioners. The third "Direct Line" program was aired on December 18, 2003. The president answered already 68 questions from citizens in Moscow, Komsomolsk-on-Amur, the coal quarry Chernigovsky in the Kemerovo Region, Krasnoyarsk, the Kant Air Force Base in Kyrgyzstan, Drilling Rig No. 504 in the Vostochno-Surgutskoye oilfield, Nalchik, Vologda, the village of Novaya Derevnya in the Stavropol Territory, Nizhny Novgorod, Michurinsk and Vyborg. The session lasted for 2 hours and 50 minutes. The percentage of questions answered was divided evenly between those sent via the Internet, which the president chose himself, those asked over the telephone, and those asked during the live broadcast. In all, there were about 1,553,000 calls. The event was dominated by Russians complaining about low incomes, with around 80 percent of all questions focusing on wage arrears for budgetary workers. Russians also brought up such issues as dilapidated housing, lack of running water, low pensions and social benefits. During that Q&A session, Putin announced his intention to run for re-election. In 2004, the Russian president held a large-scale news conference in the Kremlin instead of a Q&A session. On September 27, 2005, the fourth "Direct Line" was held. This time questions were asked not only via a specially created website and by telephone, but also, for the first time, via a short messaging service. As in previous years, most people were concerned about economic and social issues. Within 2 hours and 53 minutes, Putin answered 60 questions, 14 of which he had chosen personally. The overwhelming majority of the questions had to do with domestic policy; only six questions concerning international problems were raised, and just one touched upon a personal issue. More than one million questions were registered, including one million by telephone and over 100,000 via the short messaging service. The most active categories were the so-called blue-collar workers, office workers, pensioners, students, and housewives, who were mainly concerned about salaries, pensions, housing, healthcare services, and support for those serving in the military. On October 25, 2006, Vladimir Putin hosted his fifth "Direct Line" with the nation. It was broadcasted live on television and radio and lasted 2 hours and 54 minutes. The president answered more than 50 questions via video linkups with populated centers in various parts of the country, by telephone, and on the "Direct Line" website. Of these, 41 dealt with domestic matters, nine with international affairs, and two were of a personal nature. The overall number of questions exceeded 2.3 million, including 2.2 million lodged by telephone and 100,000 via the Internet. A special text message line was also available throughout the broadcast. Direct linkups were organized with Baltiysk, Bryansk, Irkutsk, Kaspiysk, Kondopoga, Naberezhnye Chelny, Nakhodka, the village of Podgorodnyaya Pokrovka in the Orenburg Region, and Tver. Additionally, a number of questions were also asked live from Sevastopol. On October 18, 2007, the sixth "Direct Line with President Vladimir Putin" was the largest at that time in terms of both duration and the number of questions asked. During the 3 hours, 5 minutes and 40 seconds the session lasted, Putin answered 72 of the more than 2.5 million questions. As before, people mostly expressed social concerns related to increase of salaries and pensions, social benefits for pregnant women and young mothers, housing, and rising food prices. The President also answered four personal questions, three questions about the Olympic Games, three about the army, and two about football. The studio was connected to 67 cities throughout Russia and the CIS countries, with people from 12 of them getting to ask questions. Some cities even got to ask two or three questions. In all, there were 2,276,931 calls. On December 4, 2008, Vladimir Putin held his seventh Direct Line with the citizens of Russia. This was the first time he answered questions as prime minister. The "Talk with Vladimir Putin" special program began at noon (09:00 GMT) and was aired by major Russian broadcasters 3 minutes longer than a year earlier. Putin answered 80 questions asked by phone, text messages, and online, as well as via mobile television stations installed in Russian regions. There were 1,636,800 calls and 642,000 text messages. The majority of the questions concerned the consequences of the global financial crisis, rising petrol prices, pensions, social benefits and wages in the public sector, as well as maternity capital and mortgages for young families. Putin held the eighth Q&A session called "A Conversation with Vladimir Putin: Continued." On December 3, 2009. It lasted 4 hours and 2 minutes and the prime minister answered over 80 of the more than two million questions that came in via phone, text messages, and emails. The 2009 Q&A session was focused on the major support for industries. Putin spoke with employees of the companies he had previously visited, telling them about practical support measures and promising to visit again in the event of any problems. Putin also spoke about macroeonomics mentioning figures of the 2009 GDP and industrial production. The 2010 Q&A session was the ninth live session and beat the previous record by 24 minutes. It lasted for 4 hours and 26 minutes. Putin answered 90 questions, 31 of which he chose himself. Most of the questions concerned socioeconomic issues and the consequences of the devastating wildfires that had hit Russia that summer. The prime minister was also asked about preparations for the 2014 Sochi Olympics and 2018 FIFA World Cup Finals. Overall, Putin received over 2,000,000 questions, of which half a million were texted, while 1,400,000 were phone calls and the rest came from the website. Next year, Putin spent four and a half hours answering questions. About 40 percent of the television audience that day tuned into the broadcast. Putin's tenth Direct Line Q&A session began at noon and ended 4 hours and 32 minutes later. During this time, Putin answered 88 questions, 25 of which concerned parliamentary election results, the next presidential vote, Russian political parties, Putin's political plans, personnel issues, among others. According to the direct line hosts, most of the 1,882,000 calls and texts that the specially set-up call center had received by 3:30 p.m. local time concerned the social welfare. Utilities and amenities were second most popular questions, followed by labor relations and wages. Putin was also asked on private issues such as ones about his dreams, his plans for New Year, what could bring him happiness, and which of his character traits he disliked. 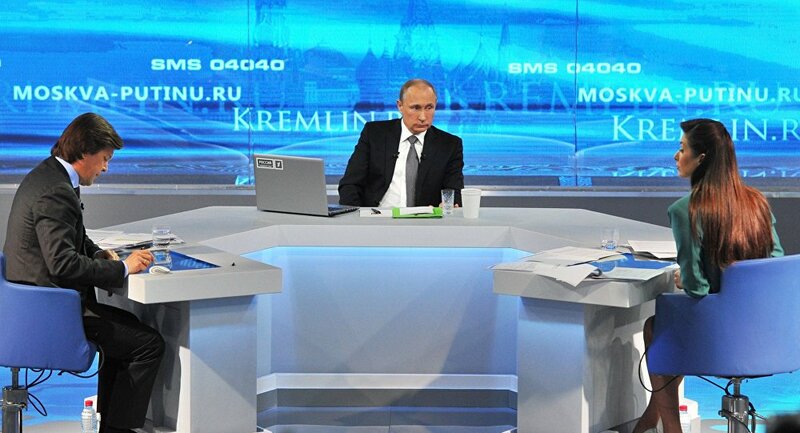 Next "Direct Line with Vladimir Putin" was hosted on April 25, 2013. With this Q&A session, Putin again broke his own record with the session lasting 4 hours and 47 minutes. The President answered 85 questions, including 24 rapid-fire questions, eight of which he chose himself and the rest were put forward by the session's hosts. During the 2013 session, the call center fielded a record number of calls; around three million calls had been received as of 4 p.m. local time. Traditionally, Russians were mostly concerned about social issues, with some complaining about inflated utility payments and low wages. On April 17, 2014, was held the twelfth Q&A session overall, the second of his previous presidency, and the first to involve residents of Russia's new region – Crimea. It was also broadcasted live. The 2014 "Direct Line" lasted 3 hours and 55 minutes. Putin answered 81 questions, 35 of which concerned Crimea and Ukraine. The studio was connected with four Russian regions as well as to a studio in Berlin, which brought together international experts from the Valdai Discussion Club. Four of the questions asked during the broadcast came from Sevastopol. Putin also answered a video question from Ex-US intelligence employee Edward Snowden. On April 16, 2015, Putin’s 13th direct line received a total of 2,486,000 questions. The Q&A session lasted for 3 hours 57 minutes. Videolinks with six Russian regions were included. Vladimir Putin had time to answer 74 questions, which concerned sanctions and reciprocal sanctions, the situation in Ukraine and such domestic issues as loans, mortgage and state service. A total of 2,500,000 questions were put to the president on April 14, 2016. That year, the program lasted for 3 hours 40 minutes, and the president answered 80 questions, which focused mainly on domestic political and economic issues. They concerned the current state of the economy, rising prices on food products and medicines, inflation, wage arrears, and layoffs at social institutions. Russians were interested in international affairs asking questions about nearly all key foreign policy issues and the more relevant issues on the international agenda. Putin talked about the situation in Syria, the crisis settlement in Donbass and the Nagorno-Karabakh region, the Russia-US relations and Ukraine. Videolinks included Crimea, Sakhalin, Voronezh Region, Tomsk and Tula.